This system permits league secretaries to set up leagues on-line. Team managers can log in and submit match results as soon as a match is over; the league table and cross-table of results are updated and displayed instantly. No more submitting results and waiting for days or weeks (or even longer) for the secretary to update the website! The leagues displayed here are for chess matches, with up to 20 players per side playing individual games that can be either won, drawn or lost. However, the concept is simply extended to other sports. A cross-table showing the results of the matches between each pair of sides. If the teams play one another home and away, then a team's row shows its home results and its column shows its away results. The home team's points are listed first. If each pair of teams meets just once then the 'home' result is duplicated as an 'away' result too, so the table is symmetric about the diagonal. If the league secretary has uploaded the fixture list, the scheduled fixture date will be shown for any match where a result hasn't yet been submitted, with imminent fixtures being highlighted. There's a similar list of knock-out ('cup') competitions. Click on any score in the cross-table and the detailed board-by-board result will be displayed, including gradings that are fetched automatically from the ECF grading database. Click on the name of a player to display all of the stored results for that player, grouped by year and division. A few pages of compiled data are available to logged-in users who aren't team managers. Requiring a log-in means that these pages, which take a lot of server time to generate, aren't triggered by web-crawling robots. Below the league table (as shown in the image above) there is a link to display results summaries for a given league: number of games and points scored for each player in each team. The same listing is available by clicking the icon on the list of competitions. 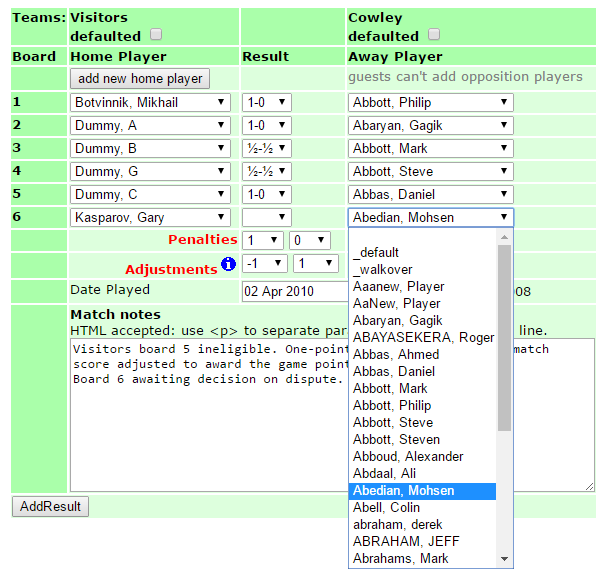 On the right of a cross-table, click the icon displays summary results for all players in a particular team, Click to show a team's fixtures, if the competition secretary has uploaded them. Below the cross-table there is a link to display all fixtures for the given league. Click on the list of competitions to list all the results in a particular competition, match by match, on a single page. This list shows the players and the result of each individual game, as well as the match result. Click to generate CSV files containing player lists and results lists for a given legaue or cup, in the format required for 'spreadsheet' submission to the ECF. This provides a useful way to access the underlying data, for analysis or for back-up. In addition to the above, designated team managers can use the 'log in' link to log into the site. This opens up some extra functions. Fill in the form and click the 'submit' button. Pick player names from the drop-down lists; if a player (for either team) is missing then use one of the 'add player' buttons to add him/her to the list. If you do not manage one of the teams you will get an error message; if you do, the submitted result will be displayed for confirmation, followed by the updated league table and cross-table. The results form includes facilities to impose penalties, e.g. for playing an ineligible player, and to adjust the match result, typically to award any points scored by ineligible players to the opposing team. The actual (unadjusted) result of the game as played will appear in the playing records of the two players and in the grading output files. Any of the team captains for a club, along with the people who are nominated contacts in the entry on the 'clubs' page, may manage that club's list of players. You can declare new players, and use the edit icon ( ) to insert ECF grading codes or ECF membership numbers, correct spellings, delete erroneous entries and inactivate players so that they don't appear on the drop-down lists used for result entry. Reactivating an inactive player takes just one click. The site downloads the membership ECF database and updates the member data every night. The large number of players in the database means that this is done in two parts: names beginning A-L one night, then M-Z the following night. Therefore after a membership number is input, it can take two days to pick up the status and the expiry date; before then, the player's membership will be shown as 'expired'. delete Bloggs, Fred - Again. Click on the score in the cross-table and the detailed board-by-board result will be displayed. For any result submitted by the opposing team, you will get a 'confirm' link. Confirmed results are displayed in bold type in the cross-table. Unconfirmed results are included in the points tables, but should be regarded as provisional. Upon viewing any result that you submitted, you will get a 'delete' link. Click it to remove the result from the cross-table and from the points calculation in the league table. There is a trial league set up to enable new users to experiment. It's in the 'Test' area and contains a team called 'Visitors'. The team manager for 'Visitors' is user 'guest'. If you log on as 'guest' with password 'welcome', you will be able to submit and delete results for the Visitors team. If you are designated as the owner of a club's entry, you will see an 'edit' icon and a 'delete' icon in the title bar of your club's entry in the club list. As a club owner, you can amend the stored details (name, grade code) for one of your players. You may also delete a player from your list, provided that he has not played any matches for you. You may flag as 'inactive' a player leaving your club: he or she would still be in the database, so old results would not break, but would no longer appear in your club's drop-down lists for submitting new results. Using the icon you can transfer games from one player to another, e.g. to consolidate two instances of the same player and enable the duplicate to be deleted. A further pair of links at the bottom of the screen caters for creating new leagues and adding new users. upload fixtures, which will then appear on the cross-table; any fixture within seven days of the current date (before or after) will be highlighted. To ease the set-up, league details (including the constituent teams and their captains) may be cloned from other leagues, e.g. the previous year's details for a particular division. Adjusting last year's set-up for promotions, relegations and any changes of captain is much quicker than creating everything from scratch. Alongside the league name, league secretaries see an extra link to add teams. Clicking the link displays a list of the teams that are part of that league to date, with a box to input the name of a new team. First, create a fixtures crosstable, e.g. in Excel, and save it as Comma-Separated Variable (CSV). The teams must be in alphabetical order. Insert a dummy date or 'n/a' (which will be ignored) for the date when a team is scheduled to play against itself. In the example below, the dummy dates are shown in green but this is for clarity only: the simple CSV format ignores colours. From the list of leagues, use the 'upload fixtures' icon (highlighted yellow below) and follow instructions to upload the CSV file. You'll get feedback to help you confirm that the team names are in the correct order and that the dates have been uploaded correctly. If anything is wrong, or if some of the dates change mid-season, just re-upload a suitably amended file. It doesn't matter if some of the matches have already been played. 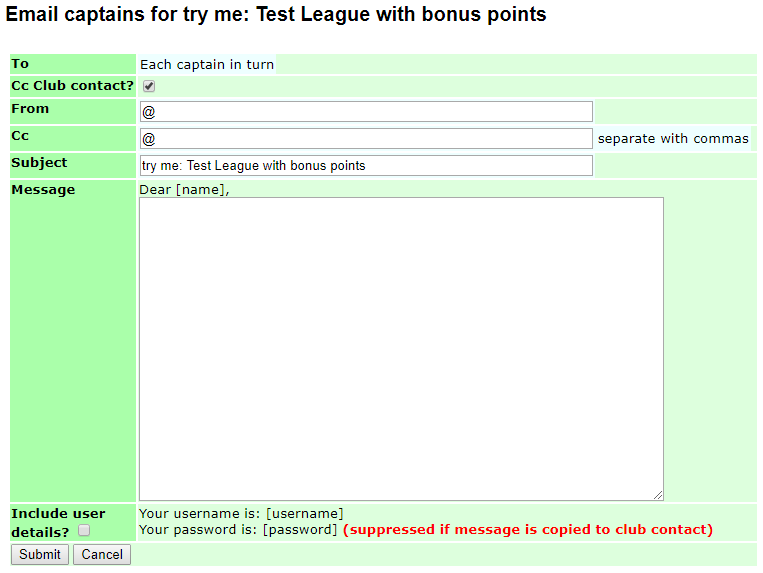 As a league secretary you may set up new usernames and passwords for team managers. It is helpful to define the team managers before adding the teams because then the manager may be picked from the existing list; otherwise you will have to go back to the team details once the manager's username has been set up, and define the manager. League secretaries may also add and confirm results. Hence it is possible to use the WebLeagues system even if not all the team managers have web access: send the results to the secretary in the 'traditional' manner, and he can add them. League secretaries may manage the player lists for any clubs that are affiliated to the league secretary's organisation, in the same way as team managers and club officials can. Clicking the icon allows league secretaries to set up and send an email to the captain of each team playing in a given competition. The email can optionally be copied to the nominated contact (usually the club secretary) for the club associated with the given team. There's also an option, which can be useful when setting up a brand new competition with a new set of team captains, to include the username and password for each captain. 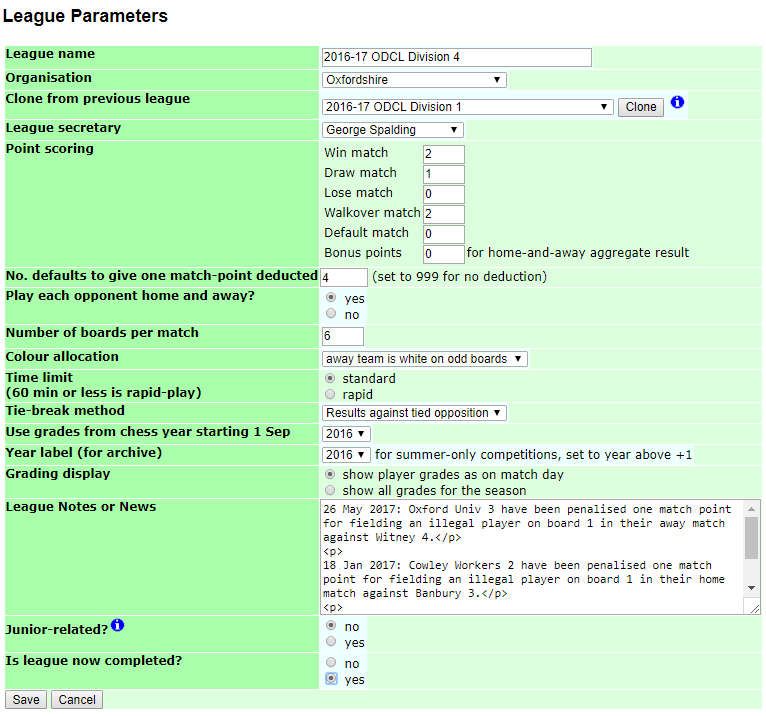 Generating grading files and web-pages compiling all the results for a league are now available to all logged-in users.